Bipolar Disorder Linked to Accelerated Epigenetic Aging | What is Epigenetics? A group of researchers from The University of Texas Health Science Center (UTHealth) at Houston reported a connection between accelerated epigenetic aging and bipolar disorder. The results, published in Translational Psychiatry, could explain why people suffering from bipolar disorder are more likely to die from age-related diseases. 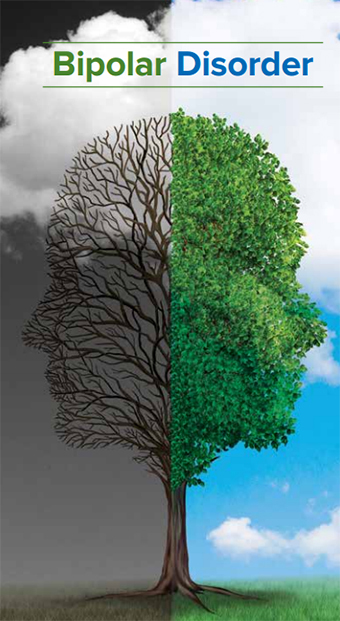 Learn about the symptoms and how to treat bipolar disorder (pdf). Credit: NIH. Click to open PDF. Epigenetics is the study of the change in gene expression due to environmental factors that do not alter the genetic sequence. While the amount of time someone has been alive constitutes their chronological age, their epigenetic age is measured by molecular markers of chemical modification to DNA, specifically DNA methylation or DNAm age. Researchers now use the epigenetic clock to estimate the age of most tissues and cell types by tracking DNA methylation, which can selectively switch off genes. In a prior study, it was discovered that the epigenetic clock may destine some to age faster regardless of their lifestyle. Histone modifications have also been found to influence aging and could perhaps hold the key to reversing aging, although much more research must be done on this fascinating subject. The team calculated DNAm age using blood samples from 22 individuals diagnosed with bipolar disorder, 16 siblings of those with bipolar disorder, and 20 healthy people. They assessed global DNA methylation and found that those with bipolar disorder had premature epigenetic aging compared to healthy individuals. The chemical tags could be adjusted due to the disorder itself, or perhaps by bad lifestyle habits involving exercise, diet, smoking, and abusing illegal substances. “Controlling these factors is just as important as taking medications,” Fries said. Older individuals with bipolar disorder, specifically those 33 years or older, had significantly boosted epigenetic aging in comparison to those who were healthy. Interestingly, no epigenetic difference was discovered in young patients. Bipolar disorder comes in several forms, including bipolar I disorder, bipolar II disorder, cyclothymic disorder, and other specified and unspecified bipolar and related disorders. These are characterized based on severity and length of manic, hypomanic, and depressive episodes. According to the researchers, epigenetic aging has been recently shown to accelerate with cumulative lifetime stress, and a faster-running epigenetic clock has been connected to greater risk of death. In addition to the epigenetic clock, the researchers also assessed telomere length and mitochondrial DNA (mtDNA) copy numbers – two other potential biological clocks. The number of copies of mtDNA is tightly associated with mitochondrial function. When investigating these other two biological clocks, they found that the acceleration of epigenetic age was associated with the number of copies of mtDNA. This suggests that the mitochondrial-nuclear cross talk might be underlying the premature aging in bipolar disorder. Interestingly, telomere length did not show significant differences between groups. More research on the complex interplay between biological clocks could shed light on bipolar disorder and contribute to developing new therapeutic and diagnostic tools. This evidence represents a possible novel target for treating bipolar disorder and helping those at risk for developing it. Source: Fries, G.R. et al. (2017). Accelerated epigenetic aging and mitochondrial DNA copy number in bipolar disorder. Translational Psychiatry, 7(12). Reference: UTHealth. UTHealth researchers link epigenetic aging to bipolar disorder. 11 Dec 2017. Web.